All extraction tools rely upon the basic principle of airflow through affected areas in order to remove water damage. High negative pressures are created by vacuum equipment, whether they’re portable or mounted on a truck. Specialized hoses, usually 2 inches (5 centimeters) in diameter are used to connect vacuum equipment to an extraction tool. Airflow through the tool and hose removes water from the material and carries it to the vacuum’s waste tank. When a light wand is used to extract water from the surface of a carpet, the weight of water is greatly reduced. This slows down the migration of water through the carpet, cushion, and building materials. However, the light wand is only the initial step in the water damage extraction process and is followed by other extraction tools or methods to remove and prevent any physical water damage. Whereas, squeegee wands are best used for removing water from hard surfaces. Deep extraction tools are used to remove water from carpets and carpet cushions. These deep extraction tools use heavy weight to create a tight seal over the carpet and squeeze out more water from the underlay. Vacuum-sealed deep extractors make a tight seal with the carpet in order to remove any water from the subsurface underlay and carpet. Deep extraction tools that are mechanical (ride on) govern their own speed. Using a mechanical extraction tool increases the effectiveness of the water damage extraction process greatly by ensuring even and consistent extraction. Different types of carpet construction can impact the effectiveness of deep extraction tools and because all deep extractors require a good seal for optimal performance, multi-level loop carpets are more difficult to extract. Air enters the extraction tool by passing over dips created by the multiple loops or other areas that are uneven in height. Carpet that is thicker or denser with fibers will also be more difficult to extract, as it’ll restrict any airflow. And similarly, thicker or heavier underlay is more difficult to extract because it also restricts any airflow. When it comes to water damaged carpet extraction, lighter face weight carpet and cut pile carpets are usually easiest to extract. When it comes to water damage extraction, the vacuum equipment truly does the real work. While the extraction tool itself is in contact with the wet surface, the vacuum is what removes water from the affected area. Types of vacuums used in water damage restoration can range from truck mounted machines that are gas powers to smaller, more portable electric vacuums. Smaller vacuums such as shop vacuums aren’t designed to properly support water removal. One of the most valuable and time-saving tools in water damage restoration is the submersible pump. Some water intrusions will result in standing water, but even 1 inch (2.5 centimeters) of standing water is significant. Every cubic foot of standing water present in a structure contains 7.48 gallon (28.3 liters) and each gallon (3.8 liters) of water weighs 8.34 pounds (3.4 kilograms). 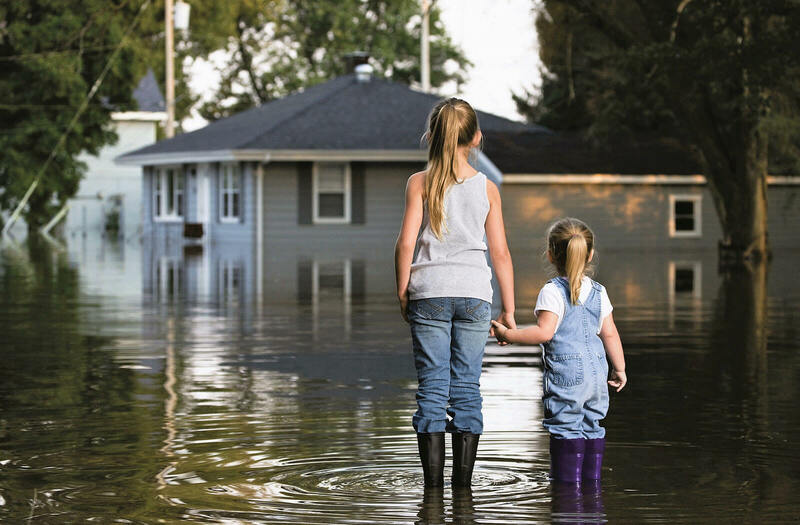 Imagine a basement or crawl space that is 20 feet by 40 feet (6 meters by 12 meters) in surface area and consider the amount of water that would be present with these numbers. In a case like this, a truck-mounted or portable extractor would be overwhelmed by this amount of water and thus, submersible pumps would be a better tool to use. As with any trade, the use of proper tools and equipment is vital to getting the job done properly and effectively.